As usual, it's important to lay out the test system so we're clear about what's used to derive these results. Over the last few years, I have standardized my testing method so comparisons between devices are done with the same same ADC, computers, and cables (or at least very close). The test set-ups above are reflective of the complexity in measuring this device. Remember that there are actually 4 analogue outputs (XLR stereo, RCA stereo, RCA multichannel, headphone) and 7 types of inputs (USB-B, USB-A, ethernet, S/PDIF coaxial, S/PDIF TosLink, HDMI, plus CD/DVD-A/SACD/Blu-Ray spinner)! Given the combinations and permutations, I'll focus on the most common ones I personally care about (for example, I almost never use USB-A so the USB-B results would be most important for me and presumably most of you also). For these tests, I've set the UDP-205 to "Linear Phase Fast" digital filter since I prefer this (discussed last time). Remember the default is "Min Phase Fast". For those wondering, the previous generation of Oppo disc-based players like the BDP-105 used linear phase filters and there were no provisions to change filters on those devices. Only more recently with the Sonica DAC did we see Oppo default to minimum phase probably due to the trend over the last decade rather than any actual technical reasons. Let's start with the input that computer audiophiles will likely be most interested in. This is of course the USB-B asynchronous input, the most flexible input on the device allowing up to 768kHz sample rate and DSD512 (note that 192kHz is the highest my ADC can go up to, and I won't be measuring DSD in this post... Might do some measurements later if folks really care about DSD performance still). Remember that theoretically, the USB-B input should also be the best of the input interfaces given timing accuracy. The only other competitor is really the gigabit ethernet which we'll look at below as well. 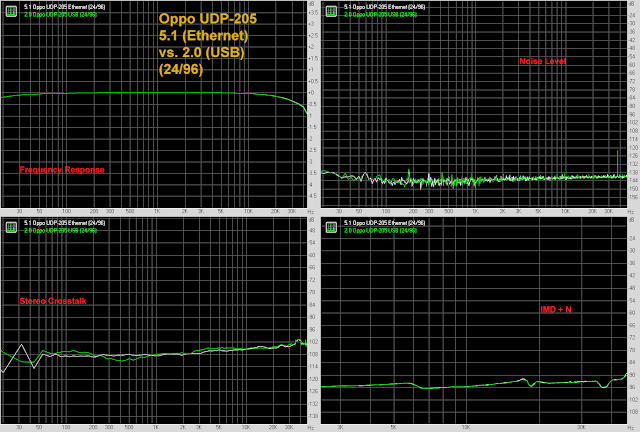 About the only relatively interesting thing is that both the XLR outputs from the UDP-205 and the BDP-105 are showing a slight dip in the low bass on the frequency response graph starting around 100Hz down to about -0.5dB at 25Hz (and -0.75dB at 20Hz). Unlikely to be audible given the frequency response of normal human hearing at the low frequencies plus typical unevenness of room responses at the low end. For completeness, I double checked and I'm not seeing this slight dip in the RCA outputs from any of the devices, nor did I measure this with the TEAC UD-501 DAC's XLR output. 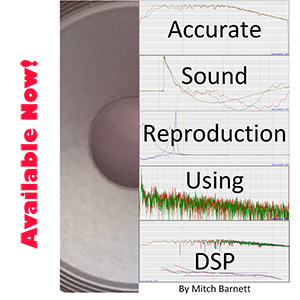 Otherwise, time and again, I've demonstrated that Redbook-resolution reproduction is really a "piece of cake" for modern DACs. There's literally no challenge in this at all whether one is using XLR or RCA. 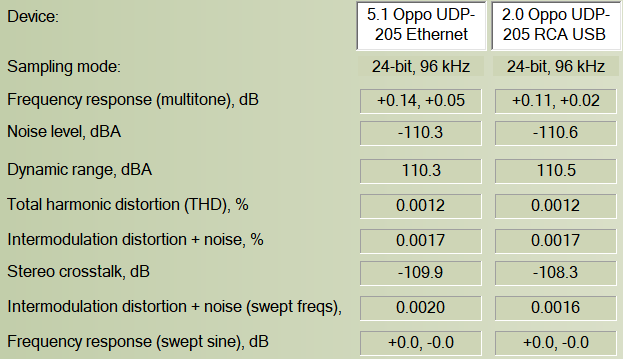 In fact, with both my TEAC UD-501 and Oppo UDP-205 easily switchable between inputs on my pre-amp, other than some amplitude difference, I'd have a hard time hearing a difference between the two DACs as suggested by these measurements. Moving along to 24/96. We're in "high resolution" territory now. Now we're seeing some significance difference in better resolution in the form of lower noise floor and improved dynamic range using the test signal. 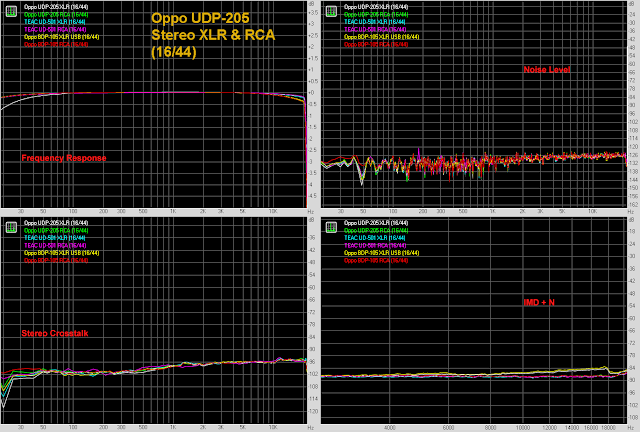 The noise level from the XLR of the UDP-205 is approaching 20-bits and represents the limit of the Focusrite Forte ADC. We've also got some remarkably good distortion numbers there - hard to believe any "golden ear" would be able to detect any issue here! Again, like above, there is a slight -0.5dB @ 25Hz dip in the frequency response of the stereo XLR output from the Oppo devices. The analogue output from the TEAC is showing a few noise spikes absent with the Oppo. Again, the UDP-205 is very close to the BDP-105 from a few years back. In the real world, let's be honest, these two DACs will sound identical when volume matched and sent the same audio data. And a couple graphs... Last I checked RightMark still has a bug with drawing some of the graphs like the crosstalk, so only the frequency response and noise level shown. Looks good. The frequency response of the headphone output is the same as for the RCA output (obscured behind the green plot). 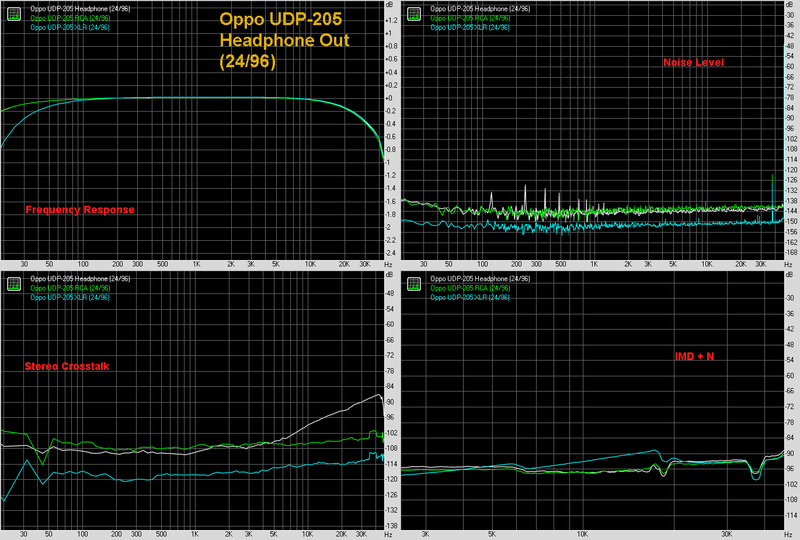 A few more noise peaks in the headphone output (multiples of 120Hz with highest peak -126 dB) - not audibly significant. As you can see, the Focusrite Forte ADC's limit for measuring from the RCA connector has been "pinned" by the Oppo UDP-205 and last year's Oppo Sonica DAC which is of course also based on the ES9038Pro. What is great to see is that the multichannel output (when playing the stereo test signal) measures almost the same as the stereo RCA output. Numerically, the Squeezebox Transporter is excellent and we can see the relatively lower fidelity of the Squeezebox Touch and Pono Player from a few years back. 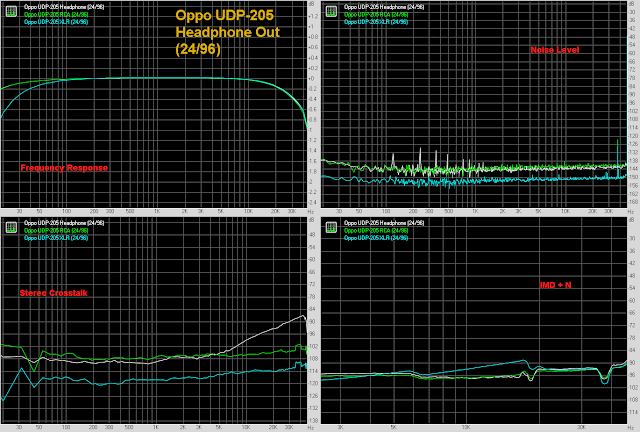 As usual, notice the dip in the high frequency response with the Pono as a result of the filter design. It's not an audible issue at 96kHz as it's beyond the audible range, but this could be audible at 44.1kHz sample rate with roll-off starting below 20kHz. My Squeezebox Touch does have a bit of 60Hz hum in the output but it's below -110dB. Overall higher IMD+N with the lower resolution SB Touch and Pono as demonstrated. Bottom line: The UDP-205 performs excellently as a USB DAC with the various analogue outputs all performing very well. There is a small dip from 100Hz down, -0.75dB at 20Hz using the XLR output which is academically interesting I suppose. As expected, the balanced XLR output provides better low noise performance for those "blacker blacks" :-). I think it's wonderful that the UDP-205 is equipped with gigabit ethernet. While the peak transfer rate likely would not be true 1Gbps speed, it's almost surely more than 100Mbps (based on tests I've seen based on various low-power SOCs with gigabit interfaces) and this will certainly help with maintaining a full buffer. Notice the top 2 tracks contain the left and right RightMark synthetic test signals. Bottom 4 tracks are passages from AC/DC's "Thunderstruck" :-). The measurements you see above are the results of sending this test signal over the ethernet as a 5.1 FLAC through JRiver. Notice that there is essentially no difference comparing the "busy" 5.1 playback compared to just a standard stereo (2-channel) test signal over USB. What this implies is that the ethernet input is obviously very good and even with the ES9038Pro chip converting 6 channels of audio at the same time, there's really no significant penalty I can measure in the form of any extra noise added to the analogue output (front outputs at least), no worsening of crosstalk, and no significant additional distortion compared to 2-channel conversion over USB! Of course there could still be anomalies below the limits of my measurement device... I certainly would not worry about any tiny differences being audible. Ahhh yes, the venerable S/PDIF digital interface. Still important inputs for compatibility for many transports these days even though IMO, if you have asynchronous USB or ethernet, stick with those instead (mainly due to lower jitter and noise levels over the years with each generation). Comparison of Oppo UDP-205 Coaxial, TosLink, and USB inputs with stereo RCA and XLR outputs. Nice. Basically the results cluster based on whether I'm measuring the RCA or XLR output. We see a very slight 1dB lower noise floor and higher dynamic range using the USB XLR combination - barely noticeable on the graphs and of academic interest. Again, very similar and I'm not going to bother with graphs this time since there's really nothing to see here to differentiate the S/PDIF from USB inputs. 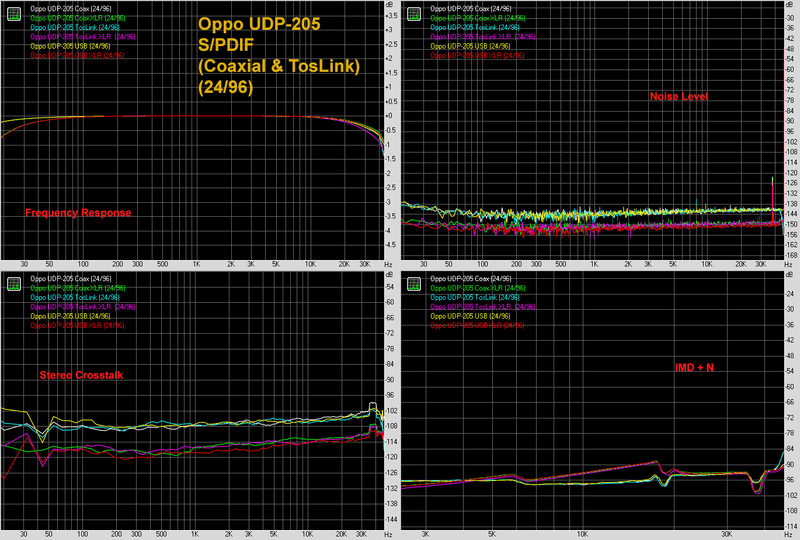 Notice that the S/PDIF inputs had no difficulty dealing with 24/192. On some devices, the TosLink input may not have the bandwidth to handle 24/192 without errors; no such issue with the UDP-205 which is expected of quality gear these days. On a side technical note, I noticed that the S/PDIF interface incorporates a muting mechanism when it detects something like 0.5 seconds of silence. Presumably this is to prevent sudden pops. This played havok with the synthetic test signals so I had to add some creative low-level noise into the RightMark test signal to "wake up" the DAC strategically! Should not be a problem playing real music but I did wonder if a longer period of silence before activating the muting mechanism would not have been just fine. Left side are the measurements in 24/96, right side 24/192. Looks very comparable. 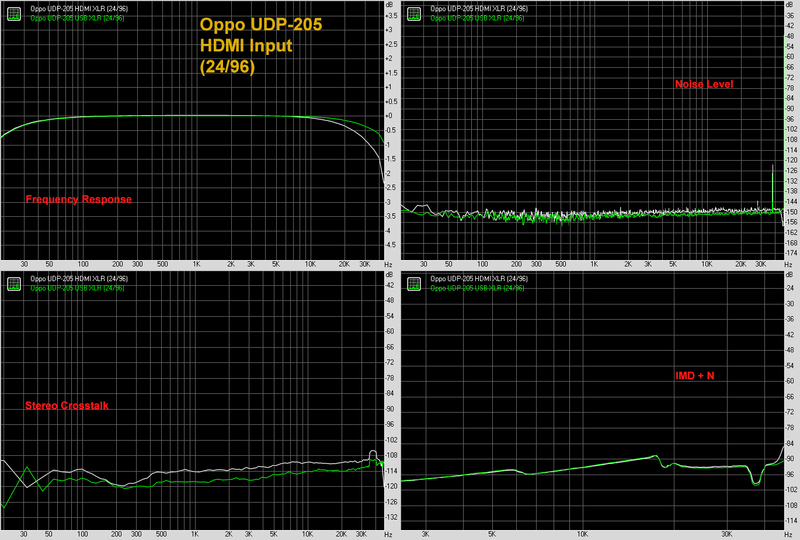 Up to 2dB lower noise and higher dynamic range with the USB input decoding both 24/96 and 24/192 test signals compared to HDMI; nothing to be concerned about at all. 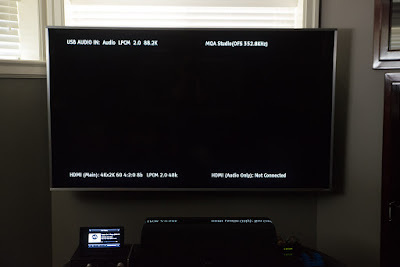 Notice that there is an earlier roll-off in the HDMI input, marginally higher noise level, and slightly inferior crosstalk (using the same XLR cables of course). Presumably the price to pay for a more complex digital interface? 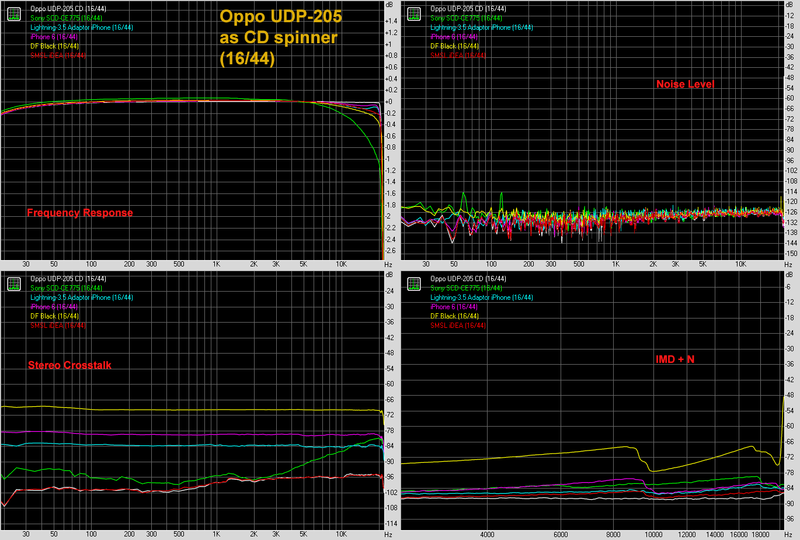 Last but not least in this series of tests for today's post... What's the Oppo UDP-205 like as a CD player? Let's measure the test signal burned on to an inexpensive CD-R (Memorex Cool Colors 700MB/80min, burned with LiteON iHAS124 DVD-RW drive at 16X speed). The UDP-205-as-CD-player results are very similar to the 16/44 USB results above as expected since this is "standard resolution" 16/44. To the right, we see comparisons with the Sony SCD-CE775 SACD/CD player from the early 2000's, Apple's Lightning-to-headphone adaptor provided with modern iPhones, the iPhone 6 headphone output, AudioQuest's Dragonfly Black, and the SMSL iDEA USB DAC. 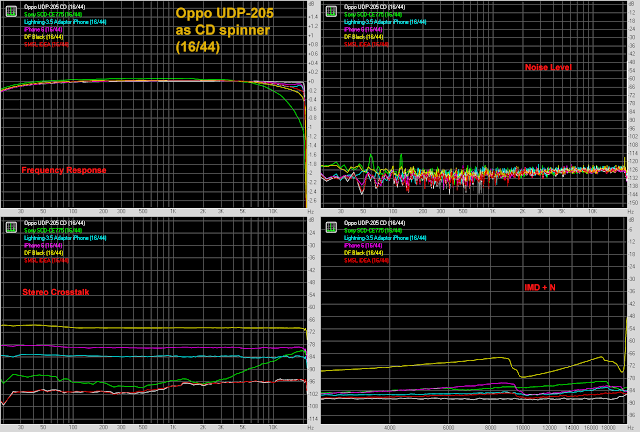 Overall we can see that objectively the Oppo UDP-205 and SMSL iDEA measure the best. Remember that the iDEA utilizes the ES9018Q2C chip, so it's part of the ESS family of devices. The old Sony SACD/CD player actually measures up quite well! 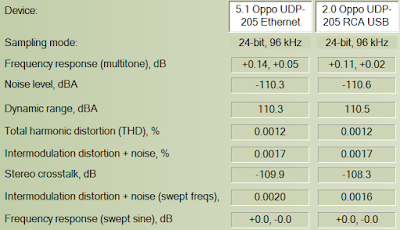 AudioQuest's Dragonfly Black as discussed previously has rather high crosstalk and distortion values as shown. What else can I say but seriously excellent results from the Oppo UDP-205 across the board using the RightMark measures? Essentially flat frequency responses (note the very slight low bass dip with XLR output which in all likelihood would not be significant), excellent low noise floor that surpasses the limits of my Focusrite Forte around 120dB of dynamic range (the Audioholics review measured an SNR of >123dB using Audio Precision gear! 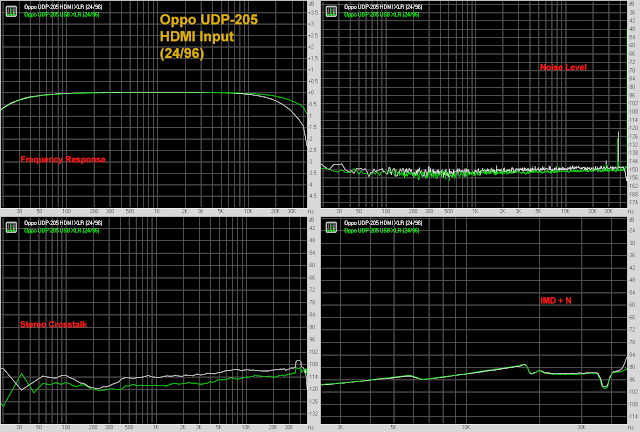 ), and very low THD and IMD distortion. These results all make for a device which IMO is "transparent" as a DAC. There's no point talking about "blacker blacks" or "veils lifted"; these results are of "reference" quality and speak of a device that to one's ears is as "black" as a black hole and any noticeable "veil" would be equivalent in opacity to the Emperor's New Clothes. IMO, there are probably very few DACs that objectively perform better than this at any price fidelity-wise. Impressive! No little "bump" at all at 60Hz even with the ultra-low noise level of the XLR output. That's all for this week. In Part 3 (likely the last of this trilogy although I might measure other things on this device in the weeks ahead), we'll look at jitter performance and some discussions / conclusions. Part 3 on jitter and concluding remarks is now posted. Remember that this was an obvious "completion" feature request I posted on in late May. Whatever the future of MQA is (which I don't think is too bright), at least UDP-205 users can now stream Tidal MQA through their computer/streamer into the UDP-205 for decoding. 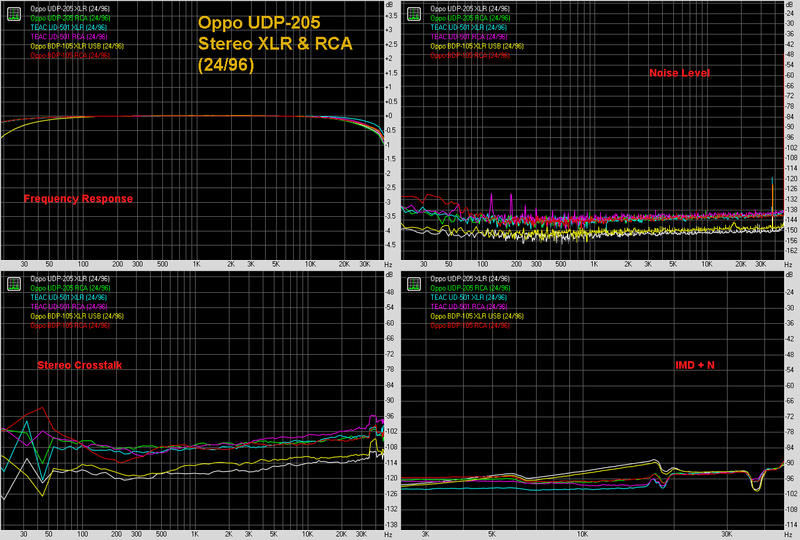 From my testing so far, the UDP-205 does not act like a "renderer" which is fine since this reduces the chance of activating inappropriate MQA digital filters. I'll still need to double check if the firmware upgrade messes up digital filters after playing MQA though. MQA decoding with Raspberry Pi 3 streamer (bottom left) to Oppo UDP-205 with v60 beta firmware. I think it's honest of Oppo to actually show that indeed the file was decoded to 88.2kHz instead of just showing a big number like 352.8kHz. Remember, all MQA decoding does is reconstruct a partially lossy 88.2kHz or 96kHz stream and then upsamples it to the "original" sample rate using its own filters. I've tested this on a number of files including 24/48 MQA files and it all looks good. Also recognizes my 16/44.1 rip of the MQA-CD Pulse/Quartet and decodes it as MQA. But being beta firmware, this is not fully bug-fixed and there is indeed a big problem! XLR output is muted with playback of anything >44.1kHz using the combination of UDP20X-60-0601B + USB0118. Even 48kHz playback mutes the stereo XLR. At this point, I've reverted back to the previous USB0115 DAC version - no MQA decode of course but no problem with XLR. Time to send some feedback to Oppo and await the next version. Presumably it's the version of MQA Encoder and hex string like a checksum or identifier. That line above actually comes from 2L's Nielsen MQA demo track. You can copy and past that line above into the "ENCODER" tag if you have an MQA file that's unrecognized and missing the tag. At least with the Oppo, the machine doesn't seem to care exactly the contents of that tag (so long as the format looks like the above). This reliance on metatagging was brought up awhile back on the Bluesound discussion forums. Keep this in mind if you intend to play back MQA lossless files through the Oppo's USB-A ports (eg. off a memory stick). The music file scanner will only pick up MQA files and play them with the MQA decoder if you have that metadata tag present. Otherwise, the MQA-encoded file will just be played without decoding. To be honest, I don't know which way is better since I don't consider MQA a benefit... That the device be always scanning for MQA encoding or have the user make sure there is that tag present explicitly. If one explicitly identifies files for MQA then maybe the system is smart enough to not apply the digital filters inappropriately, but I can imagine some MQA files getting "lost" when transcoding between lossless formats resulting in tampered metadata. Also, since I have little faith in consistent metadata tagging of files from the music companies themselves, I would not be surprised if at some point this tag goes missed from official downloads. If they're trying to make it easier and more transparent for users, IMO, it's a bad thing to rely on metadata; decoding should be automatic like with HDCD. Thanks for the great review, Archimago. This is important oto me as a relative newbie and 205 owner trying to figure out how best to set it up as a preamp for multichannel. 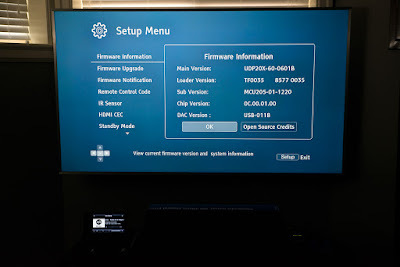 I'd like to use jRiver but am confused how to connect the computer holding jRiver to the 205. 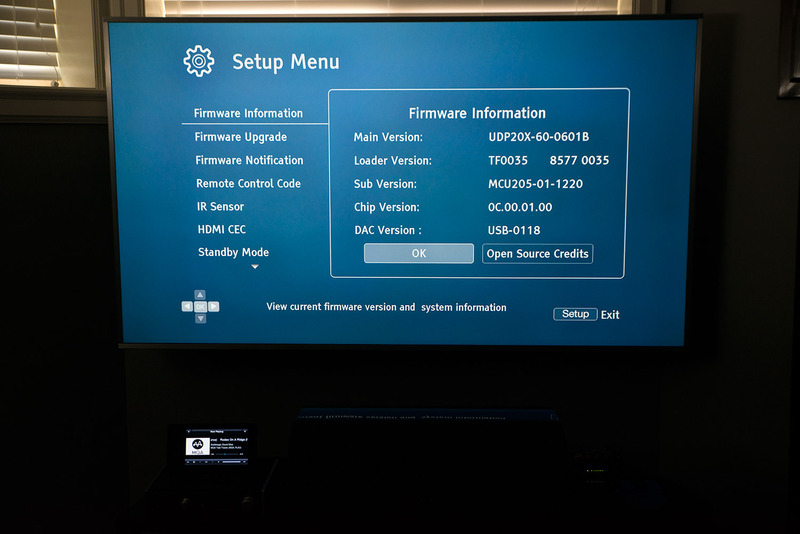 Oppo suggested I should use hdmi since ethernet wouldn't work But you managed to get ethernet going just fine. I infer that you used DLNA to communicate with jRiver to select the music, had jRiver do the multichannel decoding, and then ethernet to the 205 for the D to A conversion. Is this correct? It was reasonably straight forward. JRiver 24 on my Windows Server computer as DLNA server with 5.1 FLAC music (mostly my old DVD-A and SACD) in the library. Ethernet into the UDP-205. 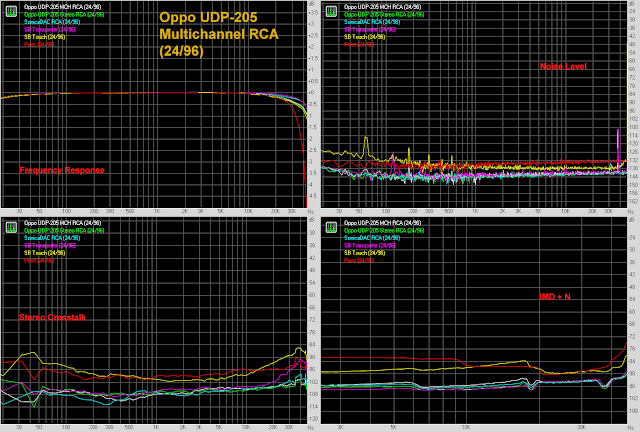 Let JRiver find the UDP-205 device to stream to. 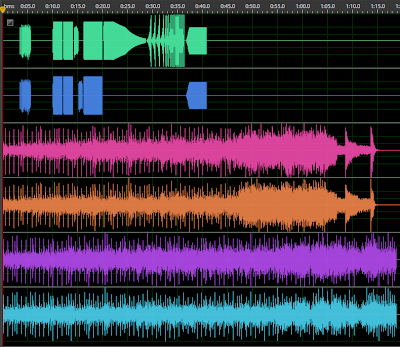 Check to make sure there's no resampling, MP3 transcoding or anything like that going on. Should be able to play back the music and hear the multichannel analog out thru the RCA. 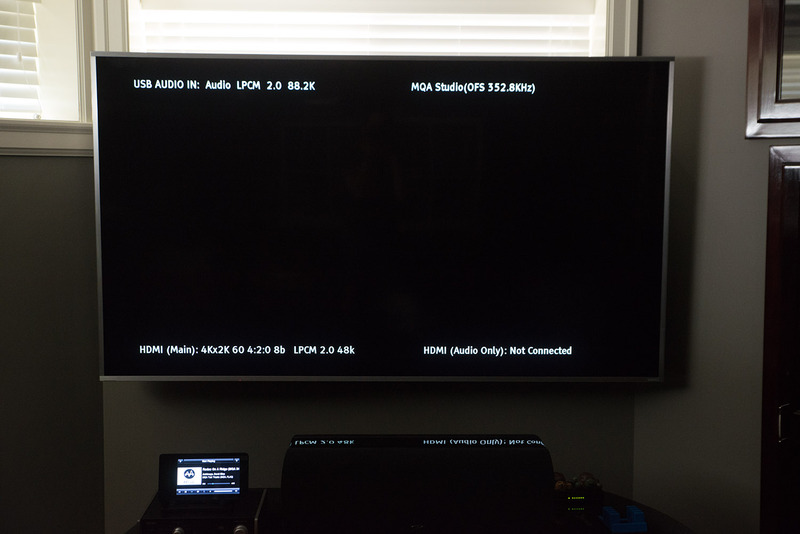 I believe I was able to have the HDMI out from the UDP-205 to send multichannel to my receiver as well which would be the preferred way to listen for me in multichannel despite the 205's DAC being technically superior! Good luck :-). I'll double check in the next couple days when I get time to play with my gear again. Thanks, Archimago, for the reply and particularly for your posts - voices of reason. Sorry to contact you here, but could please have a look at my PM to you at the Squeezebox forum?